Is exemplary. There was this girl mom met years ago, when she was taking classes at NIIT. A newly married beautiful Punjabi girl. And mom couldn't stop talking about her since and eventually I met her too. As days passed the relationship between the families deepened. She was stationed in Chennai for not too long. Maybe about a couple of years. In her I found a friend, a sister, a voice of reason in addition to my mother. Got to know the lively lovely Punjabi Culture, got introduced to this thing called Worldspace, saw her through a Karva Chauth. And then at that time I thought I should only marry into a Punjabi family. Of course, she drummed sense into me the veggie, and said I am never going to find a Punjabi who doesn't love his chicken tikka. But somehow, I think I should have a previous janma connection with the culture. I adore it and love the people. Time passed. Her husband and she moved to Jaipur. We continued to stay in touch. When we went to Delhi, we drove down to Jaipur and met up with her and the newest addition, a bonny baby boy - Dhruv. Mom was beside herself. She had a Punjabi grandson :) We discovered the marvel that is Jaipur while staying with her. I still seem to remember the zing in the air of Jaipur, the cycle-rickshaw ride, the malai lassi typical of Jaipur that cant be found anywhere else and I have a special love for the Kundan Jewellery :) Anything that is Rajasthan style jewellery. They moved to Delhi. And somewhere then, we lost touch. In all these years, I would be reminded of her several times, the times we spent together. And also tried to find her. Tried Orkut with no luck. Remembered her old Email ID, wrote in and that bounced. Several times I willed her to get in touch with me. When I went to Delhi earlier this year I tried to see if there was a way I could find her. Futile. Spoke to her for quite a while. Did a quick catch up of the years that had flown by. And am planning to go see her soon, God willing. My nephew is 5 and a half. And I have a pretty niece who is 9 months old. The world is a pink nice happy place. And somehow, I dont know why I am signing off this way for the past few posts. But this is wishing for you, that you discover something that you thought you lost and that which gives you the joy that I feel right now. And that the joy within you permeates the beings around you too. So that the small world that all of us have created for us, around us, becomes a joyous place. When you smile, may it radiate from within. And may you connect with the joy that is the core of the universe. P.S: Happy Ganesh Chaturthi! Ganpati Bappa Morya..!!! 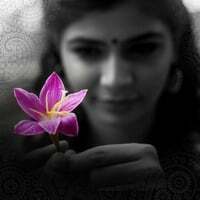 Hi chinmayi, I know exactly what you mean, because I have experienced it too. I found my long lost childhood best friend through orkut one day and I will never forget that day. No words to describe the joy. And at another time I have said exactly those last few words of yours to someone who means a lot to me. So you brought back memories. Happy Ganesh Chaturthi. - Uma. Great! How I wish I could connect to the people I keep remembering from my young age when there was no concept of Internet. Hmmm... God willing hoping for some ways I could catch up with people I lost in touch with and still hold dear to heart! Look at the time you've posted!! Good for you!! Happy days, eh..
At an odd time in the night, without even reading the whole of it, I only had to comment on the time of its post. The reason for your signing off the way you had mentioned you were doing of late is that you are happy and not just that. It's a delightful inner feeling that keeps you smiling for sometime to come even while alone. For, you've got back your lost one. And I've experienced it too. And when you experience it, you sincerely wish it happens to all around you. Those vibes will have an impact...Sure!!! I know your day starts much early. And you can already see that you've made my day..
Nice post ! am sure ur thrilled to bits. Happy Vinayak Chathurthi to you too. I understand your feeling as it happened to me as well sometime ago. After 20 years I met a classmate and time just passed when we started talking. Good that you are happy and rejoice. All the very best!! Let you get the opportunity soon to see your nephew and niece. Its show how much you are connected with them. I could guess how busy you are, but since you are blogging from 2005,why don’t you visit your long lost blog friends pages once and comment, give them a surprise and happiness. ( I am here since 6 months only). Hope you had nice Amma’s Kozhukattai!! Ganapathi papa Morya..!!!!! I Know what u are feeling rt now..itz an amazing feeling/ a nervousness/a joy with excitment to find one who is close to our heart,yet somehow v lost tuch ..trulY amazing..and i myself have found my childhood fren thru orkut!!!! Am sure if you do a bit of Facebook search you will find lot of your schoolmates too! Nice to hear akka..Happy cheerful days.Advance birthday wishes akka.May all ur dreams come true and lead a healthy life. Here in Singapore itself, it seems difficult to get in touch with people whom we have lost contact with. I suppose it is a 2-way issue. Sometimes, it is the one person who searches and it might not matter as much to the other party. Whatever it is, the joy of finding someone back is immeasurable espeially when it holds unforgettable memories. If the happiness can be so great in a small, red dot, I can just imagine the impact across borders! I know you as only a singer but after visiting your blog I knew you are very talented. I love to read your blog. This one on long lost friends touched me. I have a lady in Chennai named Vijayaloga and I am trying to get in contact with her for the past 8 years. Very nice friend of mine. She lives in Palavanthangal and me in Dallas after I got married. If only I can find her. Your blog has motivated me to find my friend. Thank you so much. Teshu sorry am leaving a comment here. Can u plz moderate ur commentz n publish them ??? I have left so many on ur blog but none gets published!!! n u dont reply to them also! I'm from Austin, USA. I'm a big fan of your program in Aahaa FM. Was listening to Reihana's program and realized that your b'day is Sep 10th - the same as mine. Wanted to wish you a happy b'day and very good luck in your career. Wishing you very happy birthday Chinmayi & May this year bring more and more successes and joys! Many many happy returns of the day. May GOD bless you with good health, lots of wealth and Cheer. Wishing you a many more''Happy returns'' of the day ! This many more should continue as 'Money More''the upcoming years...Let Nominations and award winning be filled in ur carrier.Once again Wishes for ur prosperous,healthy,wealhy life. Kevalama irundha tensun aayida dheengo. there are so many people that i have lost touch with ,from my school days, and uni days, and search for desperately on the net, facebook etc! this post really touched a nerve,and filled my heart with sweet pain! thank you for sharing!